Heritage Oaks Bancorp on Tuesday reported a third quarter loss of $10.9 million which the bank attributes to a $10.5 million non-cash charge and $4.4 million for loan losses. In comparison, during the third quarter of 2009, the San Luis Obispo based bank reported a loss of $5.2 million. During the first three quarters of 2010, the Bancorp reported a net loss of $18.1 million compared to a net loss of $3.6 million for the same period in 2009. The bank’s third quarter losses can be attributed in large part to the work-through of several large problem loans, as the Bancorp works to straiten its balance sheet by reducing the amount of non-performing assets, said Lawrence P. Ward, President and Chief Executive Officer in an earnings release. The thing that is such crap is that people are blaming this all on HOB, when in fact it is the ENTIRE banking system that is flawed. HOB is only a microcosm of what is really going on. Fractional Reserve banking is flawed for so many reasons. One of these reasons is that banks not only are allowed to loan out A LOT more money than they have in reserves, they are actually forced to do so to compete with the giant megabanks. This alone should be enough for most who understand to raise a revolution. HOB is an incredibly professional bank filled with lots of great people. Unfortunately they play the banking game in an extremely flawed system. If we ever hope to have money that actually retains its value over a period of time; holds people, government, and banks accountable for their decisions; it is absolutely vital that we return to sound money and END THE FEDERAL RESERVE. Well, greed and stupidity have consequences. How long until the bank is taken over? The stockholders should have put their money in GOLD. Heritage Oaks was set up and used by a group of people as their personal ATM for loans, similar to what the Mafia used to do with banks. Did they not know, or did the board choose to ignore problems with shaky loans to their friends. Even Dee Lacey, now Chairman of the Board, got a hefty loan from HOB. Such a shame, great customer service and the ATM always works unlike some of the other banks you cant get you money from when you need it. These losses come month after month if you look the HO’s past statements. Customers see this and pull their money making the situation even graver for them, I know Im seroiusly considering it regardless of FDIC protection, why till you have to file a claim? ——————————The FDIC has been lied to by Heritage Oaks Bank (Ref. no CSS2009N-000515-0 November 12, 2009. This comes after actions by Heritage Oaks Bank attempting to foreclose on a current loan! 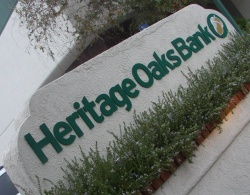 It is time to put all of Heritage Oaks Banks actions in the public EYE! Thank You Cal Coast News for not giviing up on these stories affecting San Luis Obispo Banking customers! Think Kelly Gearhart could get a loan at HOB? Oh, wait! Been there, done that…Bet HOB has retracted Kelly’s “Customer Of The Year” award. ————————-The Department of Financial Institutions is aware of actions by Heritage Oaks Bank Consummer #26608 and 0003454 showing Heritage Oaks Bank not properly applying Customer principal and extra principal paid to Heritage Bank going all the way Back to 2002. All Heritage Oaks Bank Loan Cousomers should be checking their online Statements at this time!